Thozama Qobongwana is the daughter of the first person to settle in what is now called Skandaalkamp. Her Mother, escaping an abusive marriage, seeked refuge in the City as a means to care for her young children but didn’t find that in Nyanga where she first settled. Jobs were hard to come by and the cost of living was just too much for her. At first she left her children with friends and searched for a way to provide shelter and food to her children. Her cousin was staying in a Hostel for men brought in from rural Eastern Cape to work in the city. That hostel is called Rooidakkies (Red roof) and has since become another settlement on the waste disposal site. 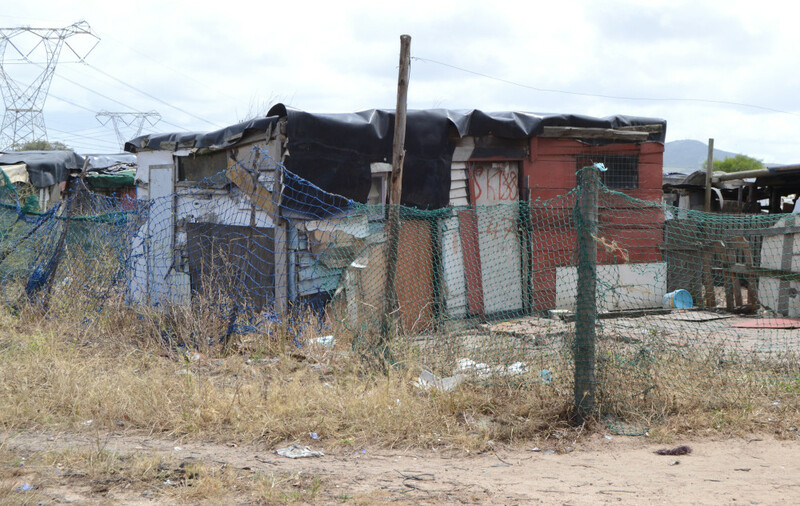 She heard of the abundant treasure left on the dumpsite and built herself and her family a structure hidden in the bushes near the hostel and the dumpsite. From there, she could scavenge for food and plentiful fabric to sew clothing which she also sold. She often found unwanted treasures such as a working sewing machine, electrical appliances, factory overruns, etc. which she gathered and sold to surrounding communities. In 1985 she brought her children across and they became the first family to settle in Skandaalkamp. 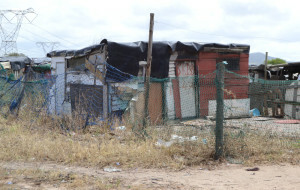 The settlement is situated on the Frankdale Waste disposal site, just off the N7 outside Tableview. It is in the middle of nowhere… Nowhere near jobs, schools, healthcare or any basic services. The only services this remote settlement receives is one tap and one chemical toilet for every 6 families. Most families grow vegetables as a means to survive. They scavenge the dumpsite for discarded food, useable items or scrap metal they can sell for some money to put food on the table. things, they simply did not exist on paper. That meant they could not enrol in school, could not access social grants, could not have a bank account or be employed formally. This is where I fell in love with the innocence of children who live in a primitive world of extreme poverty. Where some teenagers have simply never even seen the inside of a classroom. Where most children are born to mothers in their teens. 80% of the families are single mother families. Over 70% are unemployed. Many are HIV Positive and many of those infected do not receive their life-saving medication. People live in a state of despair and hopelessness. The children born here have very little chance of ever escaping the icy grip of this vicious circle of poverty. It is in Skandaalkamp that I knew I could make a difference. They had so little that anything would have made a difference – but there was something else! A charm and humility to these people who were just so extremely grateful for the smallest bit of assistance. That is how Sunshine Educare came into being… A safe place where every child is welcome, where every child receives two free meals, love, care, education and stimulation. Where every child will learn and grow and matter. Error: Error validating access token: Session has expired on Thursday, 04-Apr-19 10:42:30 PDT. The current time is Tuesday, 23-Apr-19 15:17:20 PDT.